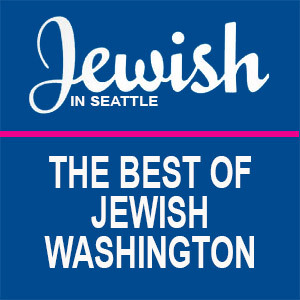 Voted "Best Adult Education" program in Seattle by the readers of the magazine Jewish in Seattle in 2016, Temple Beth Am promotes lifelong learning and is committed to being a center of Jewish life for people of all ages. Our classes, discussions, and lectures offer many opportunities for our adult community to learn at a variety of levels. The program listings below are updated frequently with a wide variety of offerings. For our additional selection of Torah Study classes, including Introduction to Judaism and Adult B'nai Mitzvah, visit our Torah Study page. Please contact our Director of Community Engagement, Alexis Kort, or call 206-525-0915 x 210 with any questions. This book tells the tale of Seattle resident Karen Treiger’s in-laws, Esther and Sam Goldberg, as they survived the Holocaust, and her odyssey of writing the book. Sam Goldberg was one of approximately 65 people to make it out of the Treblinka extermination camp alive and met Esther while both were in hiding. Hear more about their remarkable journey and Karen’s life-changing experiences of writing this family story. Karen Treiger is a Seattle native and retired lawyer. She has been named to the Jewish Book Council Author's Network and the Seattle Holocaust Center for Humanity Speaker’s Bureau. To learn more about the book and author, read Communications Lead Rachel Román's article for Jewish in Seattle magazine, "Karen Treiger’s Family History Finds Holy Moments." From October through May, Temple Beth Am holds monthly book clubs on different topics - like the Jewish Feminist Book Club and Immigrant/Refugee Stories Book Club - every year. All discussions are moderated by members of Beth Am. If you are interested in leading a book discussion or have suggestions for a topic/books for next year, please be in touch with Temple Beth Am Director of Community Engagement Alexis Kort. Following our Israeli Author’s Book Club from 2015-2016, Jewish Feminist Book Club from 2016-2017, and Immigrant/Refugee Book Club from 2017-2018, we are continuing this year with an evening Temple Beth Am book club format to discuss modern Jewish literature. All discussions are moderated by members of Beth Am. If you are interested in leading a book discussion or have suggestions for a topic/books for next year, please be in touch with Beth Am Director of Community Engagement Alexis Kort. The Ministry of Special Cases by Nathan Englander (American set in Argentina) takes place during Argentina’s Dirty War when Kaddish Poznan struggles with a son who won’t accept him; strives for a wife who forever saves him; and spends his nights protecting the good name of a community that denies his existence –and denies a checkered history that only Kaddish holds dear. When the nightmare of the disappeared children brings the Poznan family to its knees, they are thrust into the unyielding corridors of the Ministry of Special Cases, the refuge of last resort. The Religious Action Center of Reform Judaism (RAC) has selected best-selling books that address relevant social justice topics and created reading guides that provide questions to guide discussions, tips on getting started, and resources to help us take action. Reform Jews across North America have been coming together in their own communities to read, explore, and discuss social justice-themed books. Click here for more information. *Book discussion led by Dr. Jonathan Mayer, who teaches at the UW School of Public Health. The tuition fee allows for either one or two people to attend; couples are encouraged to attend together and singles may invite an interested friend. Temple Beth Am is excited to offer again the revamped and upgraded Introduction to Judaism class in partnership with the Union for Reform Judaism (URJ). Taught by Rabbi Jason R. Levine, this course is used across North America and is recognized universally by Reform synagogues, using URJ curriculum and resources for adults interested in exploring Judaism, including a Shabbaton designed specifically for this class. Topics include Jewish rituals, Jewish theology, history, prayer, life cycle, holidays, and comparative Judaism. Registration for URJ: Introduction to Judaism is through the Union of Reform Judaism. Go to their website to sign-up or contact Rabbi Sabine Meyer. The tuition fee allows for either one or two people to attend, couples are encouraged to attend together, and singles may invite an interested friend. Reading list can be found here. Used copies and e-readers are encouraged. To register for this course, please visit the Union for Reform Judaism website. Please contact Rabbi Jason R. Levine (206-525-0915 ext. 215) to inquire about the scholarships offered by Temple Beth Am. Temple Beth Am is committed to bringing the Seattle community important and informative topics that impact the Jewish people both historically and in modern times. Our Scholar-in-Residence and University Lecture Series presents engaging presenters and scholars who speak on their areas of expertise. Past presenters and scholars include Makom LA hazzan, Danny Maseng; Prof. Sasha Senderovich; URJ Vice President of Audacious Hospitality April Baskin; Prof. Hamza Zafer on "The Judeo-Islamic Experience," Former U.S. Ambassador at Large for International Freedom Rabbi David Saperstein; Rabbi Deborah Waxman; Noam Pianko on "Justifying Judaism in the Modern World"; Devin Naar on "The Sephardic Jewish Experience"; and 2017's University Lecture Series' scholar, Kathie Friedman, on "Immigrants and Refugees: We Were Once Strangers, Too." Help ensure this annual learning series continues, while keeping ticket costs low for everyone. Patron sponsorship includes tickets to all lectures, attendance at an intimate private reception with our speaker prior to the final lecture, and acknowledgement of your sponsorship in the lecture program.